Intel this summer will be releasing a new series of processor and accompanying motherboards. When you open your eyes and focus like a hawk here at Computex, you can stumble into some motherboards that actually are the new X299 platform. In the enthusiast class / range you’ll spot Skylake-X. These puppies are extreme editions much like the current 6950X series currently on Skylake-X with up-to 12 processor cores and thus 24 threads it is assumed that these processors will get a 140 Watt TDP. Skylake-X will include 12, 10, 8 and 6 core products. That 12-core version is a new one and seems to be a bit of a reaction from Intel towards AMD who will be releasing Threadripper processors with up-to 16 core parts and 32-threads. The processors once again will need a new socket, 2066-socket, and yes that means that once again you have to purchase a new motherboard. This chipset will be called X299. The X299 will bring quad-channel DDR4 support to compatible 14nm processors and 40 PCIe 3.0 lanes with Skylake-X procs. Kaby Lake-X procs will support dual or quad channel DDR4 and just 24 PCIe 3.0 Lanes. The new platform also offers support for Intel Optane and quad channel DDR4-2667 MHz memory. X99 will be based up-on a new socket, LGA 2066 that means that once again you have to purchase a new (X299) motherboard. I still need to edit the full specs, please look at the charts below for full information. I'm surprised the DDR4 is 2666 on Intel, AMD can already do 4GHz with the new AGESA. And the 7820X (8 Core) costs 600$, so in Europe will be even more. I don't see how Intel is going to get away with these prices lol. Now i just want to see the price of the AMD Threaripper CPUs. Damn, still no speed specs for skylake x.
OC RAM has always worked just fine on Intel platforms, these specs are the "default" non-OC mode, and has always been conservatively low. Estimate prices? I am guessing more then 2000€ for that 18/36. Because I doubt the jump from 10 to 12 core is that small. Pretty amazing! but the price and how much do we need those extra cores that isn't really what we need right now... Most games don't need all and most software! Prices in second slide. 18/36 is $1999. 8/16 is $599 I was pretty close on all the lower end prices. Thanks, that covers all the parts I would ever be interested in buying anyway. With the older chips like my 6700k....whatever the quoted turbo boost frequency was, was basically also a speed you could do a stock voltage overclock to with perfect stability as a rule. But with this new, multi stage turbo boost thing I don't really know what to expect from overclocking. 4ghz for the 10 core part or 4.2ghz for the 8 core part would be what I would hope for but don't know it that's too high to expect. I'm done trying to overclock to the highest possible value and dealing with the instability it brings, with either a cpu or a gpu. I want a half decent stock voltage overclock on a 6-10core cpu and then I'm going to sit on that chipset for longer than I even have before upgrading again. That, is really powerful stuff. Let me ask this to my fellow Guru's: is Intel increasing cores, but lowering overall per-core performance, yet increasing intra-core efficiency? That is a really small price hike from 10 to 12 then. Interesting. While from 8 to 10 is huge. I can see 8-core going towards 4.7+ ghz on skylake-x unless they did something funky. For the 10-core well it should do better then current 10-core one. Of course it seems these cpus are not soldered? The deepest I can go in my pocket is for an i7 7820X. Its either that or a Ryzen 1700X which I think I can get both mobo and cpu for the price of that Intel i7 above. I will wait for official reviews to see if I can make or is worth to make the jump from my 6700k. I only mentioned the Ryzen for personal reasons. Don't wanna derail the thread. I really doubt that. Most 6700k can only do 4.5ghz-4.6ghz and that's only with 4 cores and a base clock of 4ghz. If these chips EVEN overclock the same...and you add 5-600mhz onto the base clocks and then it will be 4.1-4.2ghz for the 8 core part. But if these chips get a lot hotter due to the higher cores, then I think you will see a lot of these chips maxing out at maybe 4ghz for the average chip. I couldn't make my cpu run at 4.7ghz with all the volts in the world. So I think we will see a lower clock/higher core era kicking in pretty hard. I was thinking in the lines of older 8-core parts like haswell-e and broadwell-e was not a good overclocker. You had some of the 8-core ones go to 4.7ghz. Now of course it could have changed with these. And if these really are not soldered like old HEDT cpus we might see limited overclocking partly because of that already. lol, now the prices are falling... guess AMD Is turning up the heat. 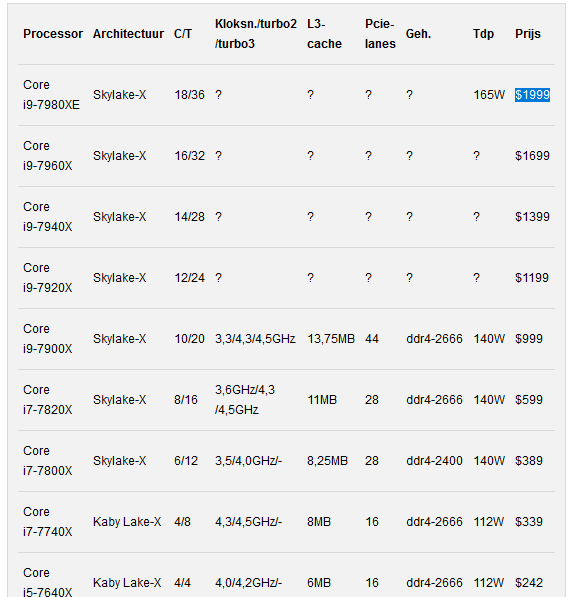 oh yeah, who the hell would wanna buy these ****ty 4 cores on such an expensive platform? why do they even exist??? rysen 6 and 8 core is still a lot cheaper, so performance per buck is still on AMDs side. now lets wait for the prices of threadripper and the platform. who knows - maybe we get a 16 core at $1000-1200?